Since leaving Psychic TV way back in the eighties, John Gosling has carved out an impressive career working with other leading lights in art, fashion and music. He's been a globe-trotting DJ and been part of the Wall of Sound label roster since its beginnings and outside of that he's become musical director for catwalk shows, including the late Alexander McQueen and more recently the Chloé fashion house. His own musical output as Mekon has been notable for featuring an impressive list of unlikely guests as diverse as "Mad" Frankie Fraser, Afrika Bambaataa, Goldie, Alan Vega and Bobby Gillespie. Piece of Work likewise features an impressive roll call of contributors. Here he is reunited with Schoolly D and other old cohorts such as Louise Winer and Rita Brown. Only Marc Almond and Roxanne Shanté appear missing from the regular names found on Mekon releases, but in their place are a number of surprising contributions including Anni Hogan and Marco Pirroni. Piece of Work pays homage to his past with a fresh and vibrant take on musical and dancefloor forms with which John Gosling has been associated. 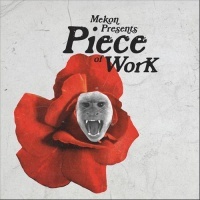 Yet more so than his previous releases Piece of Work also features some darker moments too in this brief but tantalising return of Mekon, which also features 23 Skidoo's Fritz Catlin and Pig's Raymond Watts on a number of tracks. There's a nice flow to Piece of Work as it builds from the androgynous tones of Leslie Winer through some darker instrumentals to the rousing dance floor hedonism that comprises the later parts. Piece of Work opens with Winer the former eighties fashion model and musical artist - her Witch album featured a beguiling array of downbeat rhythms - laying down an alternative take of her 'When I Was Walt Whitman' lyric in her distinctive lazy whispered drawl over a skittering rhythm, riddled with distorted and crunchy beats to which Anni Hogan lays down some fine house piano chords. Things then get progressively darker as it unwinds to the dark ambient interlude of 'Atlantis Part 3 Intro' (featuring Pig's 'Inside'), before slipping into the dreamy Balearic hi-hat rhythms of 'No Business I Know' with its chorus of angelic voices wafting over jazzy bass tones. Those haunting voices carry over onto 'Sleazy Says' a musical tribute to Gosling's former compatriot in Psychic TV, the late Peter Christopherson, who performed keyboards on Mekon's Relax With Mekon. With a haunting chorus of atmospheric voices floating over ominous arching and scraping synths; it's like a celestial take on Sleazy's Threshold HouseBoys Choir. Mekon's work is notable for its work with collaborators often putting them into unfamiliar situations, and Piece of Work is no different. That said, Piece of Work sees Gosling reunited with Cleo Torrez (Gosling was part of Agent Provocateur, alongside Torrez) who lends her effortlessly cool vocals to 'Wasted Mind' which clashes big beats with ringing guitar to great effect. Her other contribution revisits Agent Provocateur's 'Kicks' with a harder, fresher version of the track which originally appeared on their Where The Wild Things Are album. Gosling, it seems, has a thing for ex-Adam and the Ants members. The late Matthew Ashman featured in the line-up of Agent Provocateur, while Mekon's previous album, Some Thing Came Up, featured a bluesy collaboration with Kevin Mooney, who played bass on The Ants' Kings of the Wild Frontier album. This time round he's topped that with the inclusion of Marco Pirroni, Adam Ant's former right hand man. Here Pirroni produces a magnificent skulking post-punk glam John Barry twang to none other than Schoolly D who lays down a rapid fire loquacious rap. Schoolly D isn't a newcomer to Mekon either; his gangsta rap vocals featured on 'Skools Out' from Mekon's debut Welcome To Tackletown. Schoolly D's other guest slot here is an electro reworking of his mid-eighties track 'Saturday Night' where amidst buzzing bass tones and chiming synth stabs Schoolly D's explosive rap is swathed in manipulated effects. Piece of Work carries traces of Gosling's industrial past and it's most obvious in the stop-start tempo changes of the relentless rhythms of 'Bin Therre', which carries more than a trace of Meat Beat Manifesto, as it rampages from industrial techno into squelching eighties techno. 'Disco Bloodbath', meanwhile, brings terror to the dancefloor with its Hitchcockian strings and shuffling hi-hat rhythms, while Gosling's earlier Zos Kia project gets a rare airing with the stark piano score of 'Be Like Me intro' - a record which incidentally also featured Pig's Raymond Watts. That it fits here is wonderfully surprising, and really brings things full circle. Piece of Work finishes on the electro-rap rhythms of 'Ravagable' aided by the lusty tones of Rita Brown.